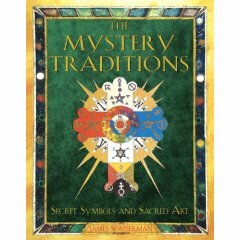 As might be expected of a book of symbols and art, this is a profusely illustrated volume depicting the history and primary symbols found in Western Mystery Traditions. The text is spare, but informative. It is the images, including several sets of Major Arcana of Tarot decks, which tell the tale. From Astrology to Visionary Art, Wasserman has gathered a huge collection of art into a unique collection. We are introduced to Cosmology, the Tree of Life, delve briefly into Initiation, Magick and the Gods, and emerge to explore Sexuality, Alchemy, and Secret Societies. The majority of the images are in color and many are stunning (the picture of the Vault of the Adepts of the Hermetic Order of the Golden Dawn is magnificent). On top of everything else this book represents a gathering together in one place of images, any one of which can easily serve as a focus for meditation. Each chapter includes a short introduction of the topic and material presented. It is difficult to find words to describe the impact of this book. Although organized by topic, the images are gathered from so many times and locations that the overall impression is overwhelming. I found myself unable to go through the whole book, except at a quick shuffle with an occasional pause for an image that ‘popped out’ at me. Perhaps that is the best way to enjoy a volume of this richness. For such a unique collection, the price of this book is well worth it and I recommend that you add it to your library.